At Heat Trace Products, LLC. we design heat maintenance and freeze protection systems utilizing various specification self-regulating heat trace cable and a full line of qualified accessories. The 2800 Series of self-regulating heating cable is just one of a number of specialized heat trace cable products that we can utilize to design a custom heat maintenance system that addresses specific heating requirements. The 2800 Series is available in 120 volt for the 3 watt and 5 watt cables and 120 or 240 volt options for 6 watt cable, and is designed to maintain continuous temperatures of up to 150°F (65°C). To learn more about this product or any of our other heat maintenance and freeze protection solutions, see the information on this page or contact us directly. The industrial grade 2800 cables provide freeze protection and process temperature maintenance for fluid transport and storage systems. 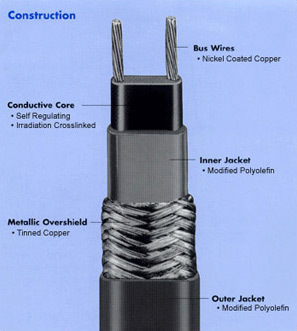 The bus wires, jackets and metallic braids can be configured for both ordinary (non-classified) and hazardous (classified) locations, including areas where exposure to corrosive or organic materials is possible. 0.125 Ω/ft *T-Rating per the 1999 NEC, Tables 500-5(d) and verified by FM and CSA. *Contact Heat Trace Products, LLC. representative for information on Division1 hazardous location systems. *The 2806 is the only 2800 Series self-regulating Heat Trace Products, LLC. that is approved for 110 to 277 Vac.